Hi there! 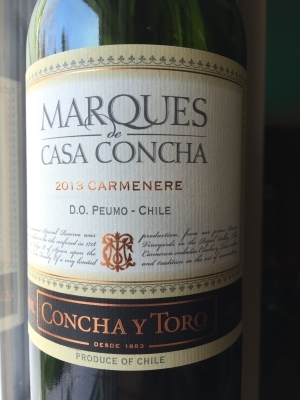 Today we look at a 2013 carmenere from Chile, which I picked up at Costco for $18. This can be quick, folks. Although Marques de Casa Concha has a very nice aroma and is full bodied, with excellent mouth feel and a good balance of dark red/dark purple fruit vs. gentle spiciness, it is…. a little sour. Because of that sour kick, I don’t recommend this one. Maybe next year!